I love performance art. I truly hold a deep reverence for it, even when I don’t fully get it. I love how it begs you to reconsider what you believe to be true or right or even normal. I would definitely categorize Starcrawler as performance art. 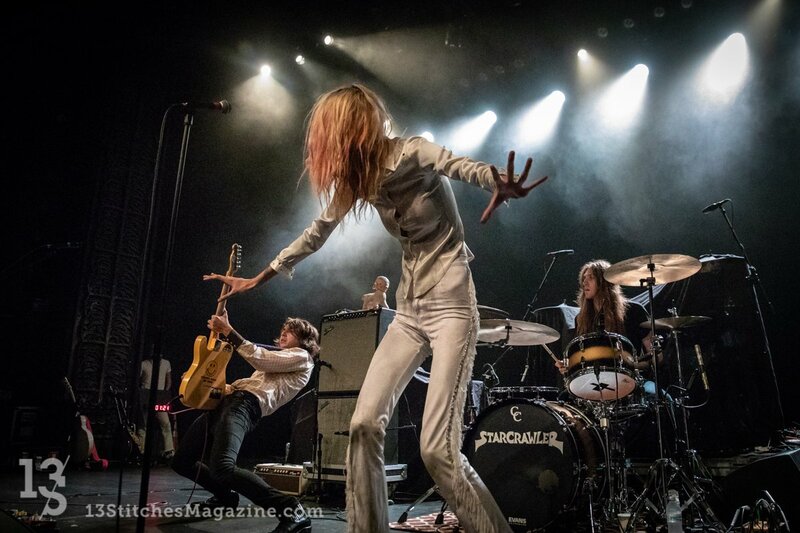 Relatively new to the scene, LA based Starcrawler left me scratching my head. Heavy metal meets punk describes their sound. And, I will testify that they have true talent and potential to gain an audience of avid followers. In a uniquely dark and intensely dramatic performance lead singer, Arrow de Wilde, captivated and horrified her audience, which was obviously her goal. While the band maintained a classic rock appearance, talent, and demeanor, de Wilde crawled and convulsed herself to horror film star status. Amidst cries of “help me” and “why?”, de Wilde used the stage to act out her own demise. The incredibly tall and lanky lead singer has allowed her super thin body to be the sounding board of her seemingly depressed and desperate cry for help. Is it an act? Or, is this talented and beautiful woman on a collision course with her own self-fulfilling prophecy? I feel guilty admitting that I liked Starcrawler a lot because liking it feeds the side of this band that flirts heavily with the darkness that we work so hard to suppress. For me, the live performance is a must see phenomenon!